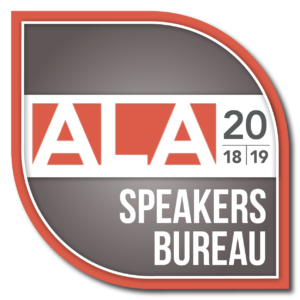 The ALA Speakers Bureau has multiple benefits and opportunities for its approved speakers. As an approved speaker, you have the opportunity to submit topics in accounting and law to the ALA community, and to outside organizations. As a presenter, your biography will be posted in a searchable database located on alacommunity.org. This database can be searched at no cost by members and non-members alike. Interested organizations may then contact the potential speaker directly for detailed information, such as cost (if any) and availability. Speakers Bureau applicants must be active members of the ALA in good standing. ALA membership does not guarantee presenting to the ALA Community. Speakers are reviewed before approval and listing on the Speakers Bureau page. Not a Member Yet Join Now!